The situation at the ill-fated Algo Centre Mall was becoming so desperate that the bank threatened to pull the mortgage, the Elliot Lake Inquiry heard Monday. E-mails showed Royal Bank called for $3 million in repairs — or it would call the loan. The threat sent the Nazarian family, who owned the mall, on a frantic scramble to forestall the default, but the needed repairs were never made. "We were in desperate need of funds to fix the roof," testified Levon Nazarian, who worked closely alongside his father as an independent contractor and administrator. "We were trying our best efforts to stop the leaks." Major tenants talked about vacating the mall because so much water was coming in. "Several tenants are threatening to leave the property or withhold payment," Jim Davis, a commercial mortgage specialist with the bank, wrote the Nazarians on Aug. 20, 2008. "We are somewhat dismayed that the property has been allowed to deteriorate to this extent." The Nazarian family had paid $6.2 million for the property in 2005, putting up $2 million in cash and taking out a $4.2-million mortgage. Levon Nazarian told the inquiry his job involved finding money to make the repairs. He was asked to explain invoices from a company called Empire Roofing, which was set up by one of his father’s employees. Those invoices were sent to the bank to show repairs were underway and to satisfy the mortgage conditions. Commission counsel Peter Doody was incredulous. "So the company that was going to do the work was going to borrow the money to pay itself," Doody asked. "I don't understand how that makes any sense. It sounds like a great deal for the owner." Levon Nazarian admitted Empire Roofing never carried out any repairs listed in that contract. 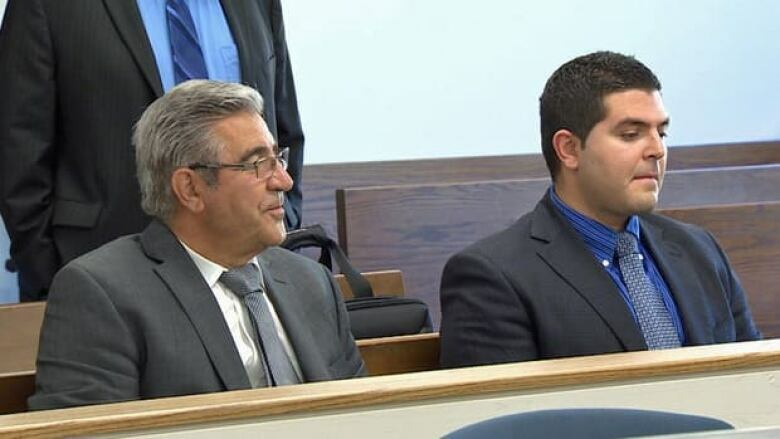 Levon Nazarian, 29, arrived at the inquiry building Monday morning, along with his father, Bob Nazarian, who owned the ill-fated Algo Centre Mall for its final seven years. They sat together in the benches inside the inquiry room before Levon was sworn in as a witness. The pair are slated to testify over the next two weeks about their roles in the tragedy. Levon Nazarian was described as the leasing manager and real estate adviser for Eastwood Mall Inc., the Algo Centre's parent company. Monday morning, he was led through the financial records of the properties his family owns or has sold in the past. Commission lawyer Peter Doody pointed out financial documents show those properties have brought in about $10 million — and the capital expenditures going out were around $3 million. The inquiry has heard previous evidence that Bob Nazarian told people he didn't have the money to fix the forever-leaking roof at the Algo Centre. Levon Nazarian agreed with the figures presented by Doody. Witnesses have described Bob Nazarian, who turns 68 next week, as someone who could be charming, but also as a tight-fisted bully who fired employees and contractors at will and badgered others into falsifying documents to downplay the mall's state of disrepair. Evidence before the inquiry to date is that Nazarian either would not or could not do what was needed to save the mall, whose problems began with its poor design and construction in 1979. "It is very concerning … when lives are at stake and Mr. Nazarian has blatant disregard to provide adequate safety measures in his hotel and mall," former mall manager Henri McCleery said in one statement. "Mr. Nazarian has always tried to take short cuts." Nazarian, of Richmond Hill, Ont., bought the mall through his company, Eastwood Mall Inc., from its second owner in 2005. He has said he spent about $1 million on repairing a roof beset with problems he inherited unwittingly. "A lot was hidden from Bob before he bought the mall," John Beaudin, a mall maintenance worker, told police last year. "They made it look good." In an interview with The Canadian Press earlier this year, Nazarian denied doing anything illegal. He accused the media of "twisting these things and making them negative." Nazarian's lawyer, Michael Title, has said a series of engineering reports done after 2004 — including one done for the Royal Bank ahead of advancing a $3-million mortgage — rang no alarm bells. "All of the reports that I've read would have convinced me that everything was fine," Title said in an interview in March. "The structure was deemed structurally sound as late as May 2012." The inquiry has since heard Nazarian pressed an engineer to alter an inspection report to downplay the problems in the weeks before the collapse. Commission counsel has met with the Nazarians, but Doody would not elaborate. Doody did say a long-running battle over access to Nazarians' documents that required intervention from an arbitrator has now been resolved. On June 23, 2012, part of the roof-top parking deck caved in on staff and shoppers, sparking a frantic but fruitless search of the rubble for survivors. Days later, searchers pulled the bodies of Lucie Aylwin, 37, and Doloris Perizzolo, 74, from the twisted remains. The public inquiry was established in July 2012 by the Ontario government and has been underway in Elliot Lake since March. The Nazarians will be among the last of about 70 witnesses testifying at Part 1 of the inquiry into the causes of the collapse. Part 2, which will look at the emergency response to the collapse, is slated to begin at the end of the month.